Running a company is not everyone’s cup of tea. From reviewing the performance of staff to ensuring the timely completion of projects, there are many things that an entrepreneur has to look into. Therefore, he may not always have the time to answer important business calls. 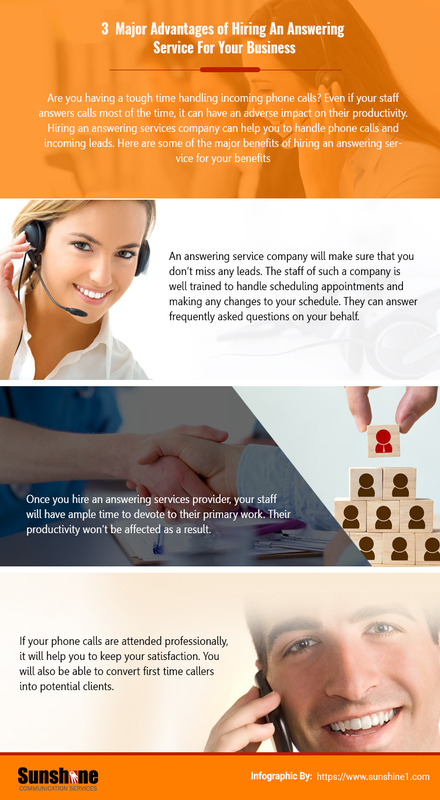 Hiring an answering services company can be helpful in such a situation. An experienced answering service provider will ensure that you don’t miss important leads. Their staff is well-groomed to handle the scheduling of appointments in an efficient manner. By hiring an answering services company you can make sure that your staff has ample time to focus on their major responsibilities. Their productivity will therefore not be affected in any way. You will be able to maintain a high level of customer satisfaction if your calls are replied professionally. Therefore you will have the opportunity to convert first-time callers into potential customers. Please include attribution to sunshine with this graphic.